It's had the nation gripped and now finally it's time to find out who Balaclava Man is in the police drama Line of Duty. Could it be DCI Roz Huntley's husband Nick? Or lawyer Jimmy Lakewell? There are plenty of other suspects in the mix. As the climax approaches, we caught up with series creator and writer Jed Mercurio to give him an AC-12 style interrogation. Is it true a sixth series is not confirmed? We definitely have a fifth, not a sixth... but we haven't started working on it yet. I need to think what the character is first. Did you instantly think of Thandie Newton for the role of DCI Roz Huntley or were other people in the running? It just evolved. I don't normally think of a specific actor, I concentrate on the character and then when we get into pre-production that's how names come up. I always knew Thandie was top talent, she was a real laugh on set. It was the easiest casting process I've ever been through. Did Thandie's status as a Hollywood star have an impact? We were flattered she wanted to do the role - most of her career she's been doing Hollywood movies so it was a boost for the whole team. How do you come up with the plots for Line of Duty? I come up with the story ideas on my own. I like to sit at my desk... sometimes I get inspiration when I'm going about my normal day-to-day life. Then when I've come up with some sort of story, I get the editorial team on board and we try to develop it. I then write an outline of the first episode which takes about a week. Only when we are happy with the first episode do we start on the second. Can we expect any surprises for the final episode? (pauses, laughs) You will just have to watch! How do real-life police officers react to the plot? One of our intelligence advisers for the show said his team have been trying to crack who balaclava man is - it's quite funny. What would you like to explore in the next series? I want to look at the personal lives of all the regulars in series five - they've taken a backseat in this series to Roz Huntley, so it would be good to explore that side of things a bit more. The regulars are definitely up for doing more... that's if they survive the final episode! What's more important, ratings or awards? I always try and distinguish between facts and opinions. I am just pleased the show is being watched. Ratings are the most important thing. What advice do you have for budding crime series writers? Just write, write, write. Watch lots of shows and films in that genre. Read lots and think about story and characters. Are you tempted to write over in the US? I actually went over there for a while when my career was quiet over in the UK. I wrote pilots for shows over there for about five years. I like the differences between American and British television dramas. 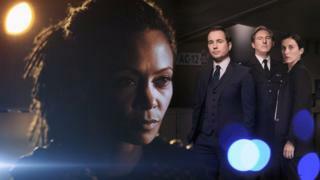 The final of Line of Duty is on BBC One on Sunday night at 9pm.